PhotoScribe® PS-970 form scanner offers full duplex bitonal or greyscale image capture and can process forms up to 18” in length. It sets a new standard in data and image processing innovation and has been used around the world to process complex and time critical exercises. 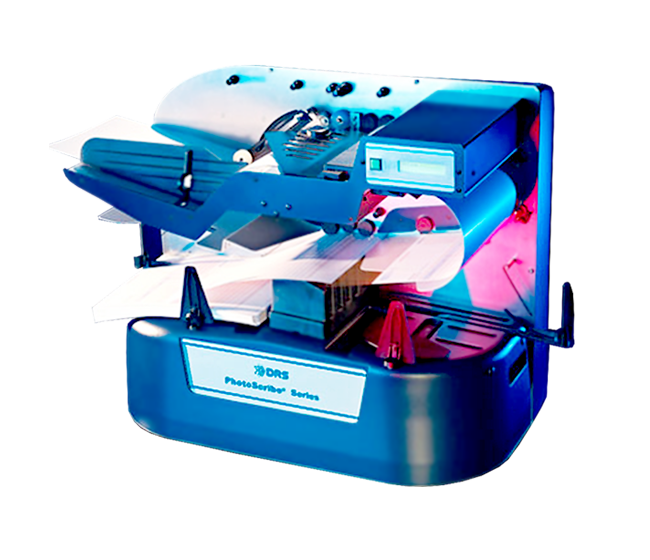 DRS takes a holistic approach to time-critical, complex, high volume data capture and although the PS960 has been designed to handle most paper form types, it is primarily intended for use with forms designed for electronic data capture. That is, printed on high quality paper with form design elements that assist quality checking during scanning. As part of its service offering, DRS provides a specialist and highly qualified forms design and print facility experienced in producing such high quality forms to ensure efficiency and accuracy are maintained throughout the data capture exercise. The key distinguishing capability of the PS960 over traditional document scanners and readers is 'real time data capture'. Unlike conventional imaging scanners or readers which only produce an image, from which data is later extracted, the PS960 allows an application to retrieve data and images from a form while it is still in the reader. The results can be used to control which output stacker a form goes to or to control what is overprinted on the form. It can even be used to take further conditional actions and collect additional data and images depending on the results retrieved. The design of the doubles detector has been proven by DRS over many years and guarantees two pieces of paper will never be drawn into the reader and scanned at the same time. This is very important as it reduces the need for costly and time-consuming corrective actions later in the process. The PS960 not only detects double feeds instantly, but it also automatically refeeds the sheets through the reader using the built-in doubles removal system. This is a mechanism that simply pulls double feeds back into the input hopper and rescans. This further improves throughput by ensuring a reader is not sat idle waiting for a busy operator to remove double sheets and refeed them. Optional stacker extensions allowing for use of forms up to 18”. Application specific validation, flow control and general data processing are provided by the software being used to control the reader. However, the firmware in the PS960 handles all interaction with its operator so that the application does not have to deal with the complexities of handling multiple sheets and exception processing. Although multiple complex operations are running simultaneously in the background, the PhotoScribe® interface presents a very simple model of 'one sheet at a time' to the software. The seconds wasted on clearing paper jams can add significantly to the schedule in large-scale data collection exercises. If an exception occurs it is imperative that it is both detected and resolved as quickly as possible. The PS960 has been designed with an open paper path to allow for quick and easy resolution of transport issues. Its aim is to ensure overall throughput is maintained at the highest possible levels. Similarly, consumable items, such as the rubber transport wheels or carriage printer ink are easily accessible and user-replaceable, without any need for downtime. Networked or Non Networked The PS960 software technology is built around Windows Operating System. Real-Time Data Capture The key distinguishing capability of the PS960 over traditional document scanners is ‘real-time data capture’. Dynamic Normalisation ensures the background of a form is clean and white while protecting foreground content such as faint marks and writing. A high capacity input hopper and primary output stacker reduce the amount of loading and unloading of forms. The second and third stackers are used for application specific purposes and ensure that the main processing can continue at speed.